Rarely has an active MLB player been honored with the Key to the City by the Mayor of an opposing metropolis. But that’s precisely what happened in 1998 when New York City Mayor Rudolph W. Giuliani declared October 17th “Sammy Sosa Day” in the Big Apple. The ceremony in City Hall Park followed a spectacular parade up Lower Manhattan's Canyon of Heroes in honor of the Dominican-born baseball star. According to Giuliani, the accolades came as a result of Sosa and Mark McGuire battled neck-and neck throughout the 1998 MLB season in their quest to set the single season home run record. Sosa, who broke Roger Maris' existing record of 61 homers, finished the year with 66 long-balls, four behind St. Louis’ McGuire. In June of ’98 he hit 20 home runs, setting a single-month record. 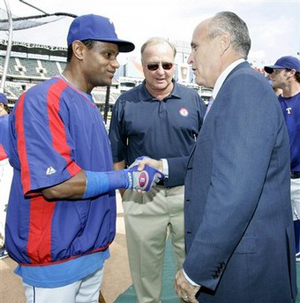 "On behalf of all New Yorkers, it is my great honor to present Sammy Sosa with the Key to the City and proclaim Saturday, October 17th Sammy Sosa Day in New York City," Mayor Giuliani said. “He is a great representative of the very best in sports, in character, in ability and as a role model for young people. Today we honor not only his 66 home runs but also his work raising funds for underprivileged children in Chicago and the Dominican Republic. He has continually demonstrated heroism in the face of difficulty or adversity and hardships to inspire others." "New York City is home to the largest Dominican community outside the Dominican Republic and is proud to have one of its heroes come home," the Mayor concluded. 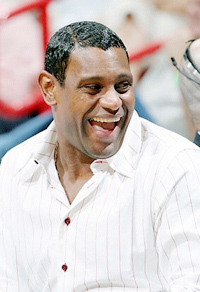 Sammy Sosa was born in 1968 in San Pedro De Macoris, Dominican Republic. He wore number 21 when playing for the Cubs, in honor of Hall-of-Famer Roberto Clemente. During 1998, he received the Gene Autry Courage Award, for heroism in the face of difficulty, overcoming hardships to inspire other. Sosa, who supports schools and medical facilities in his homeland, was honored for his generosity to children and the poor.